For helping children learn to sew. Finger guard or needle guard for helping children learn to sew. Helps teach the spacial relationship of fingers to the needle. Fits short shank machines. Nova's Sew Straight Guide and the presser foot are NOT included. Place U-shaped indention on the right hand side of the presser foot. Loosen the presser foot screw slightly. The loop should be on the left side, curling up from the rear, and slips between the presser foot and the presser foot screw. Slide into place and tighten screw. 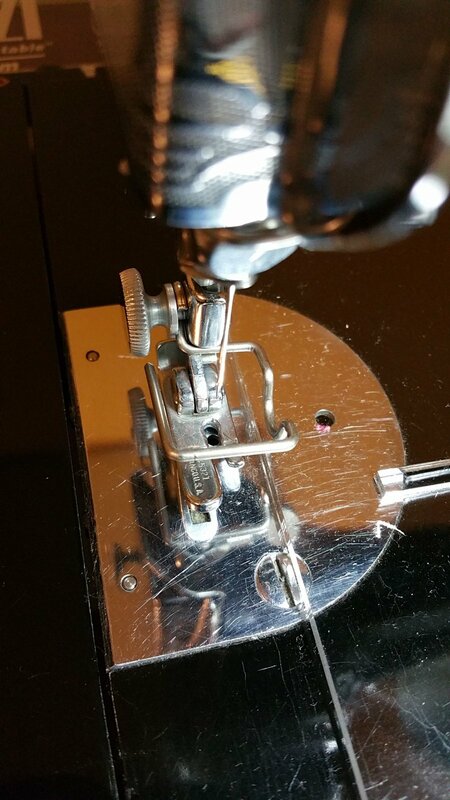 Photos show guard in place with original presser foot and Nova's Sew Straight Guide (not included) also in place. Will NOT work with some 1/4" feet!